Devotees wave palms and lay down cloths and flower petals for the Palm Sunday Procession at Santa Isabel parish, Malolos, Bulacan, the Philippines. Photo courtesy of Catholics & Cultures. All my life, I’ve associated Holy Week and Easter celebrations with a range of sights, sounds, and smells — even the anticipation of the arrival of spring — that my American parish and family settings provided. 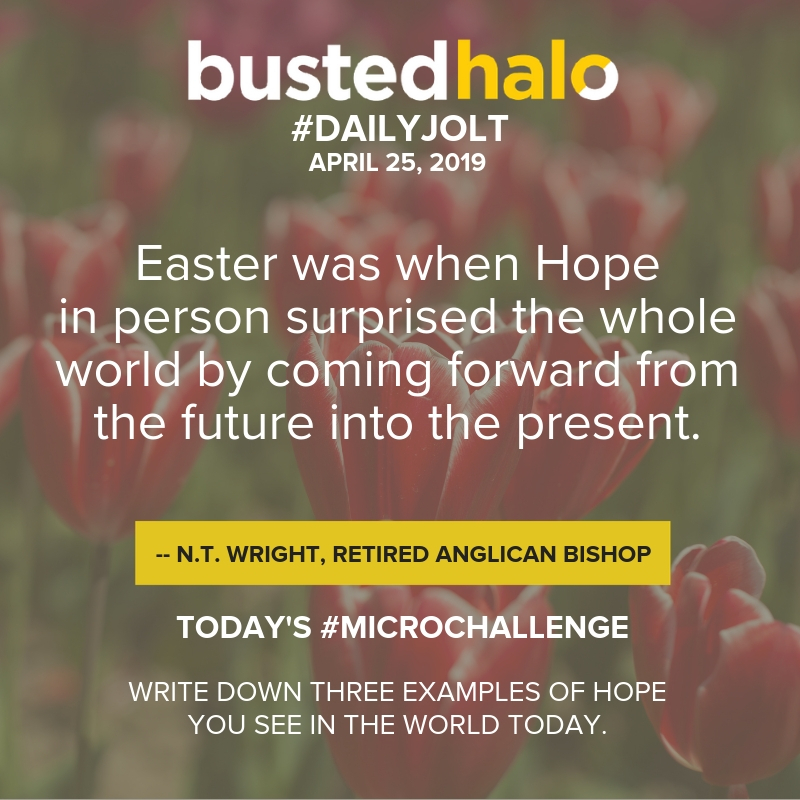 For a long time, I imagined that Catholics in other parts of the world practiced in the same ways that I did, whether with the Easter egg hunt and gifts I remember as a child, or centered on the Easter Vigil as I especially am as an adult. We tend to view the Church through our own cultural lens, forgetting, say, that for most Catholics in the world, spring is nowhere on the horizon at Easter. And the ways Catholics practice and experience their faith can vary dramatically in the cultural context in which they live. This is particularly visible during Holy Week. Comparing traditions during Holy Week gives us a chance to recognize Catholicism as the vivid tapestry of practices and cultures that it is. It’s eye-opening to see some of the ways that ordinary Catholics take over their cities and villages with dramatic public spectacles that bring business as usual to a halt. Others celebrate in quieter ways, in a fashion that their culture and history allow. Even in places where Catholic practice is most similar to ours, like Hong Kong, the experience of an Easter Vigil with 50-100 adults being baptized and received into the Church changes the experience. Learning about Holy Week practices in other cultures can give us a greater appreciation for the deep connections that link Catholics and the profound ways we express our faith. Catholics celebrate the Easter Vigil at the Cizhong parish, Yunnan, China. Photo by Liu Haiming for Catholics & Cultures. 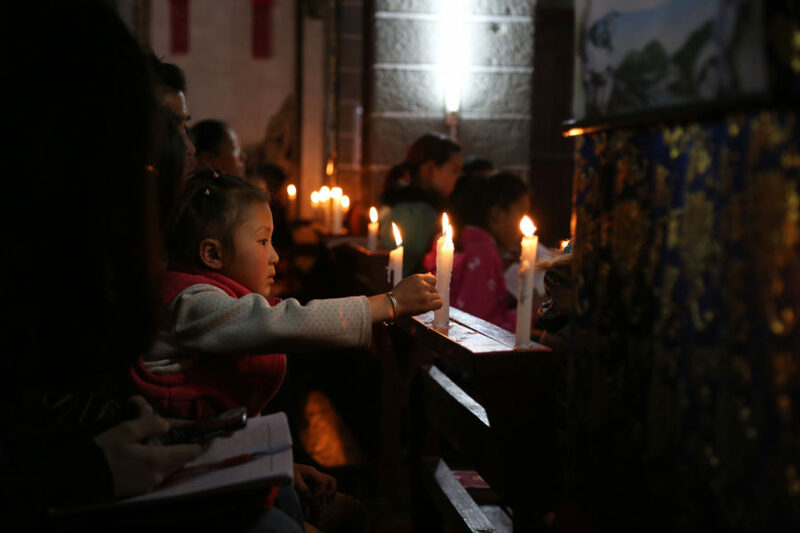 In the remote Lancang River Valley of China, small communities of Catholics practice their faith in the way it was introduced to them, by French missionaries in the late 19th and early 20th centuries. Under missionary leadership, they composed Tibetan-language Catholic chants in a local musical style that sounds nothing like any music we associate with Catholicism. After the cultural revolution of the 1960s and 1970s that suppressed all religion in China, they rebuilt their churches but had no priests, so they relied on the hymnals that survived. Even in churches where priests visit or have been reinstalled, these chants endure as an important part of worship — and are used to celebrate the Resurrection alongside newer-to-them Holy Week rituals such as the washing of the feet and Stations of the Cross. 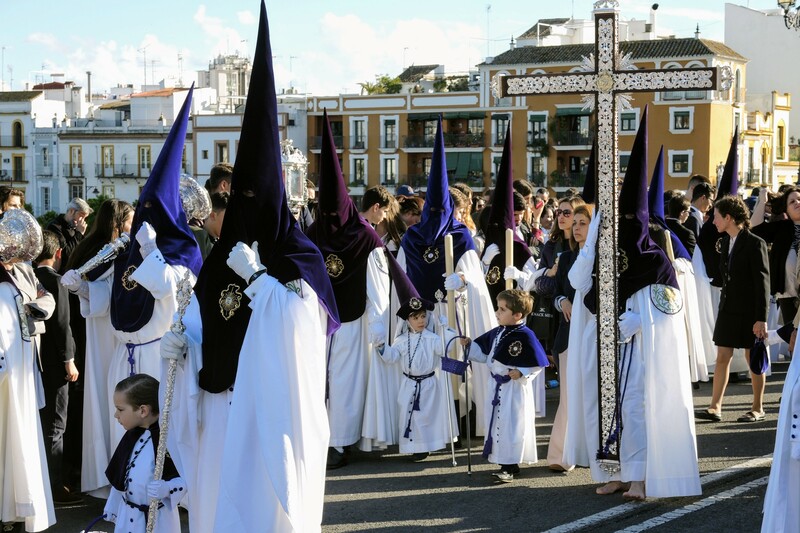 Holy Week processions in Seville, Spain, are often upbeat, social occasions when the costumed participants include children who pass out candy to other children sitting along the route. Photo courtesy of Catholics & Cultures. During Semana Santa, or Holy Week, in Seville, Spain, confraternities, lay organizations at the heart of Catholic practice for a quarter of the city’s population, take turns processing ornate, heavy platforms with statues of the Passion and the Virgin from their home parish through the cathedral in the center of the city. Sixty confraternities of more than 60,000 people take part in processions that last up to 13 hours. Many thousands more line the narrow streets to watch. 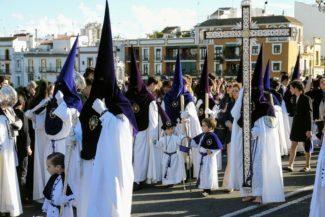 The processions are marked by penitents who march wearing hoods and the iconic pointed hats called capirotes, while others bear crosses. The statues are carried by dozens of men, hidden under the platform, who rock and sway along to the impassioned music of brass bands. 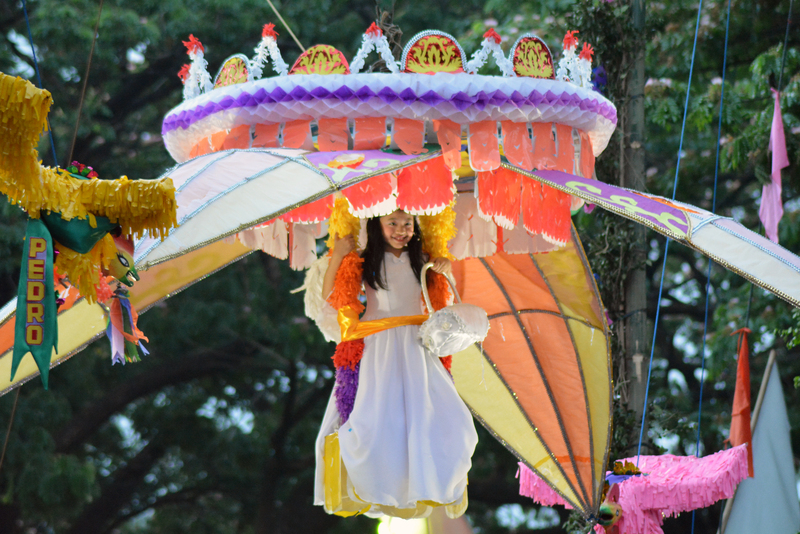 Processions begin each afternoon and continue well after midnight. The tradition may be hundreds of years old, but the processions draw out young people in large numbers. Even in secularized Spain, this is very much a powerful, living tradition. 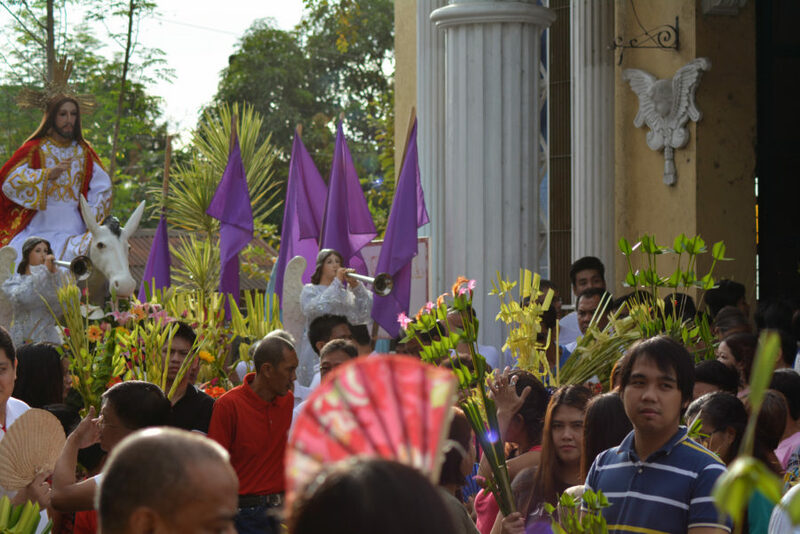 At a salubong, or welcome procession Easter morning in Angono Rizal, Philippines. Photo by Esmeralda Fortunado-Sanchez for Catholics & Cultures. In the Philippines, where 80 percent of the population is Catholic, devotion is always out front and fervent in the streets. In addition to the Holy Week Masses, processions, rituals of chanting the Passion in homes, and a tradition called Visita Iglesia, when Catholics vow to visit at least seven churches between Holy Thursday and Good Friday, many Filipino communities also host street plays, called senakulo, that reenact the life and Passion of Jesus. The actors describe this as more than a performance, but as the fulfillment of a vow, in thanksgiving for favors asked and favors received. In the pre-dawn hours of Easter morning, a salubong, or welcome procession, brings together statues of the Risen Christ and still-mourning Mary. When they meet, a bit of pageantry reveals a young girl who removes Mary’s veil to end her sorrow. 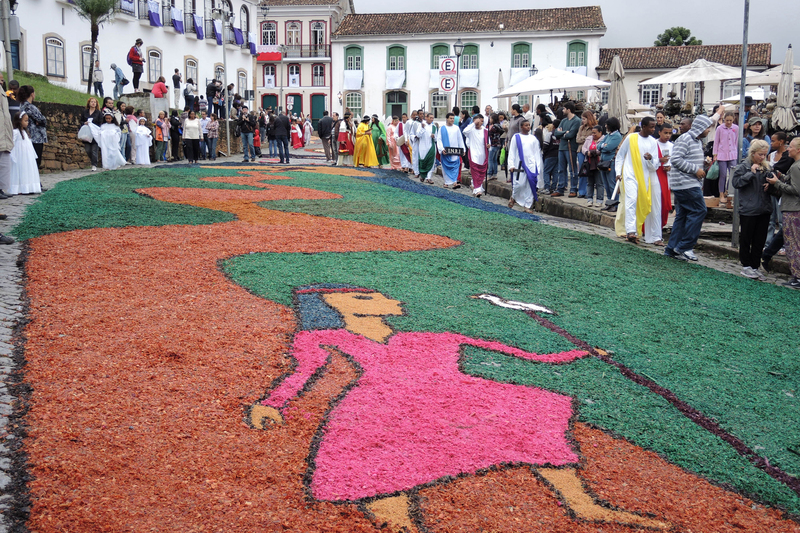 Townspeople dressed as biblical figures and angels gather for the Easter procession in Ouro Preto, Brazi. Photo courtesy of Catholics & Cultures. In the former mining town of Ouro Preto, Brazil, its opulent Baroque churches serve as anchors for celebrations and processions throughout Holy Week. 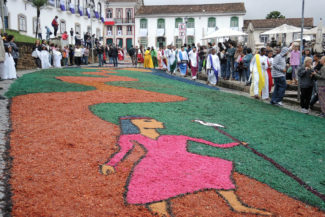 The grandest of these processions happens early Easter morning when adults and children dressed as biblical figures and angels walk upon a half-mile long “carpet” exquisitely designed each year on the streets using vibrantly colored sawdust. After Saturday evening’s Easter Vigil Mass, university students and families work through the night laying out sections of the carpet with religious themes, animals, flowers, and other patterns. All of this is for one purpose and lasts only for hours. After the procession, their ephemeral act of devotion is simply swept away. From the very popular Easter basket blessings in Romania and Ukraine to overnight processions in El Salvador, there is an extraordinary range of practices that bring Easter and the Passion stories to life in people’s imaginations. This year, I’ll be spending this Easter in Yap, an island of Micronesia where Catholic women wail the Passion on Good Friday and dance the Resurrection story on Easter Sunday. I look forward to sharing that story! 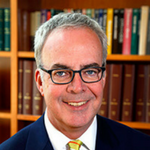 Thomas M. Landy, Ph.D., is director of the Rev. Michael C. McFarland, S.J. Center for Religion, Ethics, and Culture at the College of the Holy Cross and founder of its initiative on Catholics & Cultures. Since 2013, he has been traveling the world to document the religious lives and practices of ordinary Catholics. He writes about these at catholicsandcultures.org.